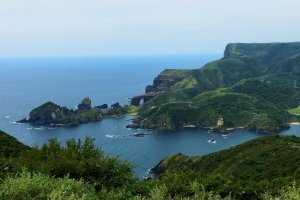 The Oki Islands is a group of over 180 islands located 40–80 kilometers off the coast of Shimane Prefecture in the Sea of Japan. Only four of them are permanently inhabited and are split into two groups: Dogo Island (Okinoshima) and the Dozen Islands (Nishinoshima, Chiburijima, and Nakanoshima). Due to its rich geological heritage and geographical isolation, the area boasts unique landscapes, flora and fauna, and traditional customs separate from mainland Japan. 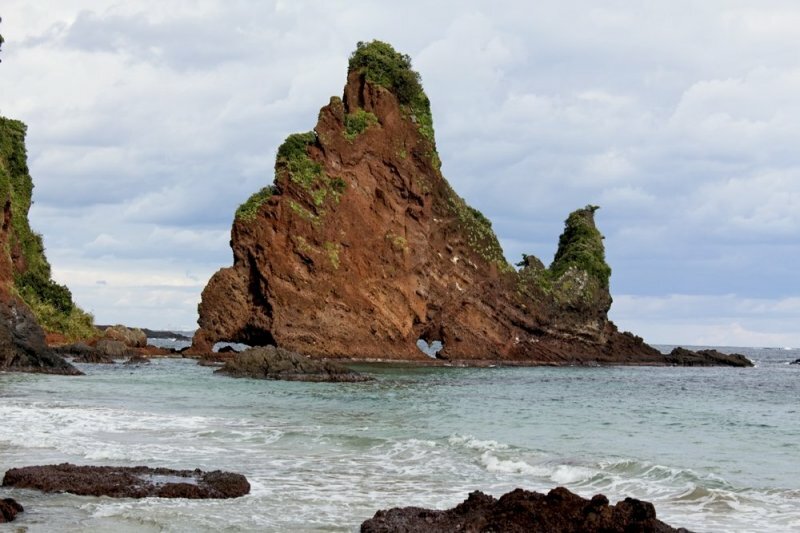 Because of this, the region has been designated a UNESCO Global Geopark and it is also part of Daisen-Oki National Park, to ensure its unique ecosystem and traditions are protected for future generations. Okinoshima is the so-called Dogo Island of the collective Oki Island group. It is the largest of the four main inhabited islands and boasts many shrines both large and small, as well as stunning coastlines and unbelievably old trees. 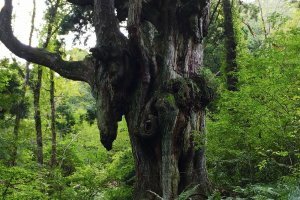 The Chichi-sugi ('Old Man Cedar Tree') is a mysterious and strangely shaped tree, estimated to be about 800 years old. Impressive in size, it measures 30 meters high and about 11 meters in diameter. Roots appear to drip down from its branches, giving it a haunting look. 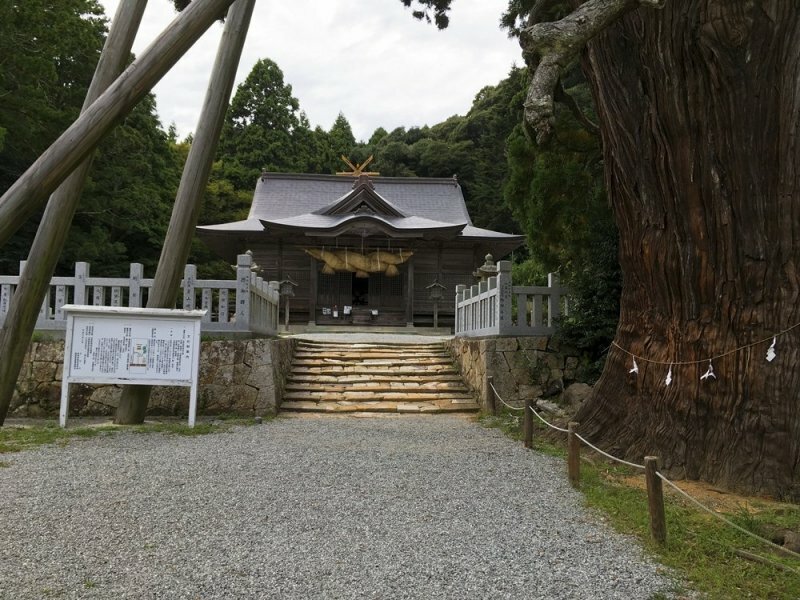 The Chichi-sugi has been worshipped as a sacred tree for centuries by locals and perhaps for good reason — it iis enveloped in a cool mist even on hot days. 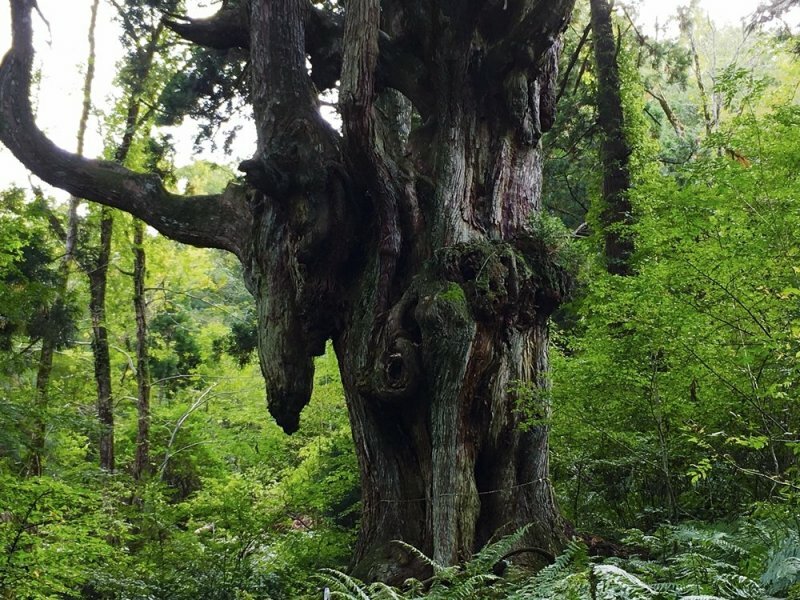 Another ancient cedar, the Yao-sugi, can be found at Tamawakasu-mikoto Shrine. Local legend states that an 800-year-old Buddhist priestess called Yao-bikuni planted the tree. It’s estimated to be over 1000 years old. 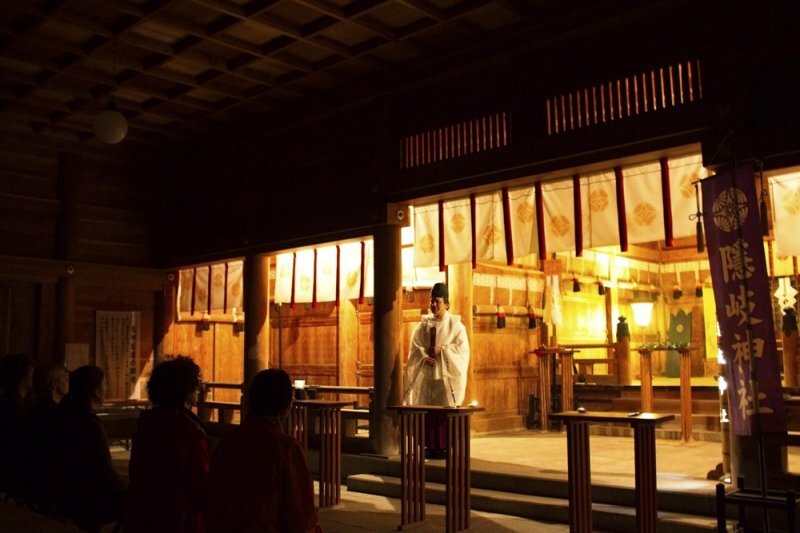 Visitors to Tamawakasu-mikoto Shrine may want to time their visit for early June, when the Gorei-furyu Festival takes place. It’s a unique event where horses are led galloping past the Yao-sugi tree through the shrine grounds with impressive speed and dexterity. 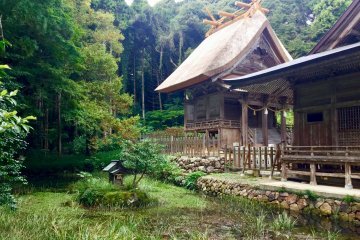 Tucked away in the deep forests of Okinoshima, a visit to this stunning sacred space feels like entering a different world entirely. 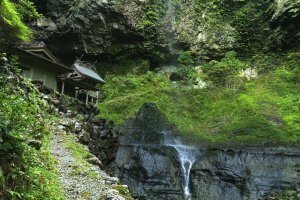 Follow a dirt path that runs parallel to a stream and be met with not one, but two waterfalls and a beautiful shrine nestled in under the mountainside. 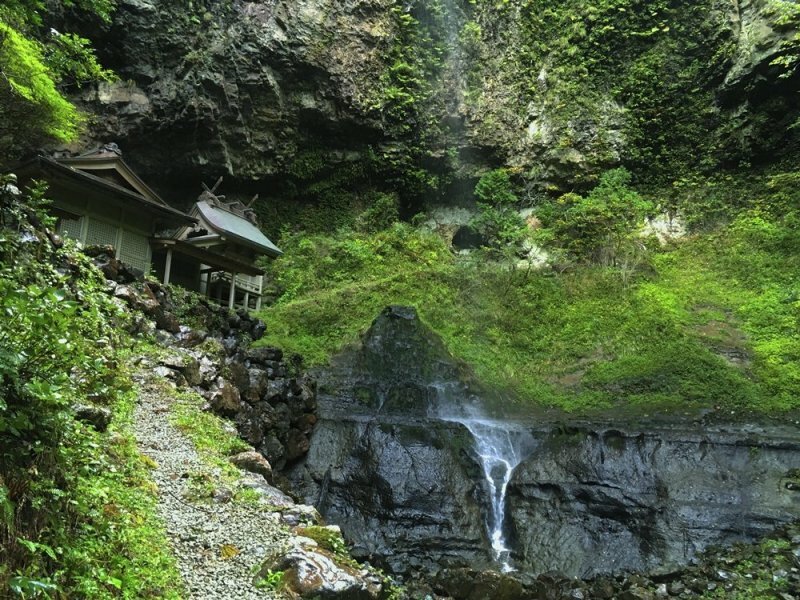 The two waterfalls plummet down on either side of the shrine from about 40 meters above. Spring water is available to drink here and is said to have special properties that give good luck. Even now, locals visit the shrine to wish for good luck before bull sumo tournaments, a traditional practice that has been a part of the Oki Island culture for hundreds of years. 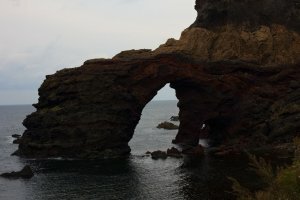 Bonus Highlight: If you’re hungry for more detailed information about the unique geology of the islands, head to the Oki Nature Museum inside the Geopark Visitor Center. Here a wealth of resources (and a fun trick art photo spot) await. Literally named “the western island”, Nishinoshima boasts vast open landscapes where visitors can hike among semi-wild horses and cows. For those heading to the Kuniga Coast, stop by the Akao Lookout first to get an idea of how vast the landscape is before hiking through it. The lookout is also an excellent place for watching the sun set over the coast, as it is one of Japan’s top 100 sunset spots. The Kuniga Coast boasts some breathtaking views and one of the best ways to take them in is to walk across the coastline. 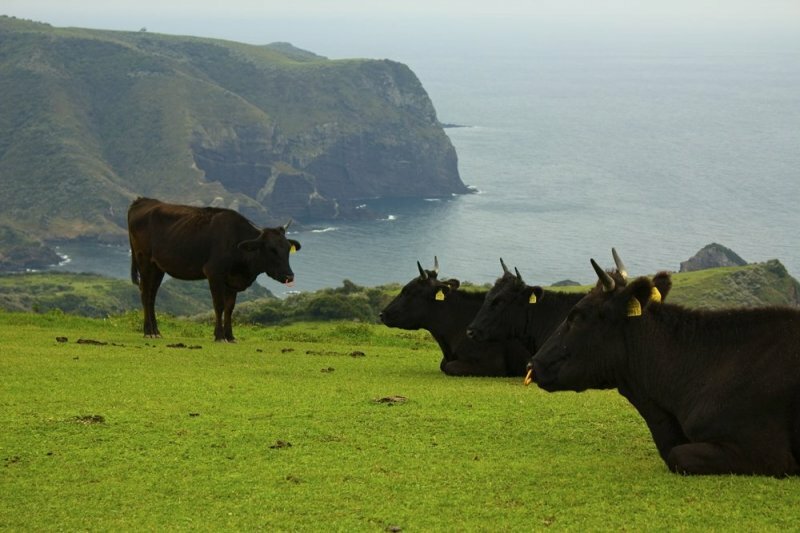 Start at the top of Matengai Cliff, a 257-meter-high cliff and walk along it through vast fields and rolling hills, where you can meet semi-wild horses and cows along the way. (Note: though both horses and cows are semi-domesticated it is not permitted to touch them and getting too close to them is at your own risk.) Once you’ve descended from the Matengai Cliff, make sure to turn around to appreciate exactly how far you’ve come, and see its jutting edge towering above the crashing waters below. Soon you’ll be close enough to see the Tsutenkyo Cliff, an arch formed by crashing waves and wailing winds. 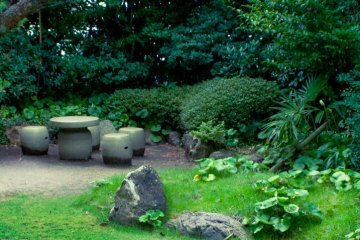 Towards the end of the trail, you’ll see the Kannon-iwa Rock, a sharp, thin rock that juts out of the ground. Its name refers to Kannon, a Buddhist deity, as it looks like the Kannon statues you can see across Japan. Before heading home, take a rest at the picnic area here (complete with benches) and enjoy the sunset. Drop by between late-August to mid-September to see the sun perch itself on top of the Kannon-iwa Rock, making it look like a lit candle. Bonus Highlight: Takuhi Shrine was built in 1732, making it the oldest building on all of the Oki Islands. 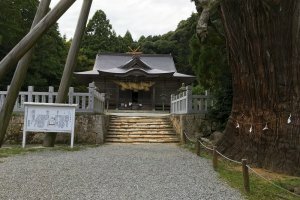 Enjoy a refreshing hike through lush forests to reach this historic shrine nestled in the mountainside. 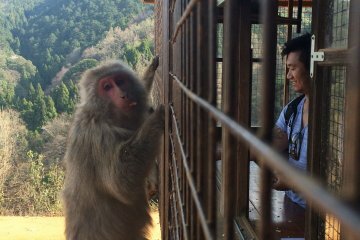 The smallest of the four inhabited islands, Chiburijima boasts a minimal population of roughly 600 people, 600 cows, and an estimated 2,000 wild tanuki (raccoon dogs). Mount Akahage is the tallest mountain on the island at 325-meters high and offers panoramic views of the surrounding islands and, if you’re lucky, you can see Mount Daisen on the Shimane Peninsula. Here you can see the remains of stone walls, evidence of a unique farming tradition only practiced on the Oki Islands, known as makihata. This method was a form of crop rotation with four fields and was used as late as 1970. While similar crop rotation practices were performed in Europe in the Middle Ages, these were mostly three-field cycles. 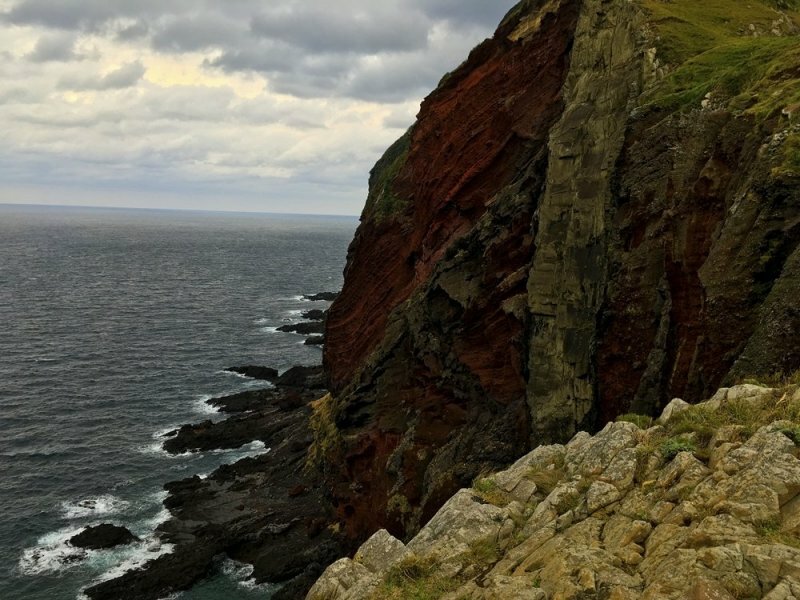 Sekiheki (Red Cliff) is a vibrant, rusty red cliff on the Chiburijima Island coast and while beautiful in its own right, its geological makeup makes it even more fascinating. The cliff is essentially a cross-section view of the mouth of a pyroclastic volcano. The layered patterns of red and black rock show former volcanic eruptions. Despite the visual difference between layers, their geological composition is identical, only differing in how quickly they cooled after an eruption. The red rock—rich in iron—shows how dynamic splashes of lava cooled quickly and oxidized as soon as it was exposed to air, while the black rock flowed smoothly and didn’t oxidize. 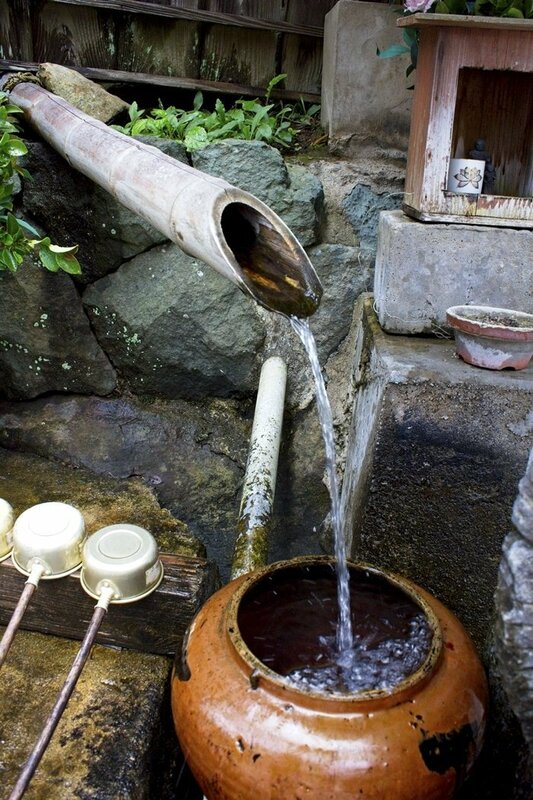 Bonus Highlight: Stop by the Kawai Guardian Deity Water Spring offers visitors a bit of a good luck as well as a chance to fill their water bottles with fresh spring water. 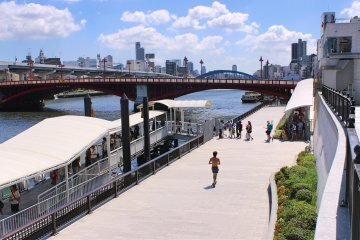 Home to the exiled Emperor Gotoba for many years, Ama Town on Nakanoshima is rich in historical gems. Oki Shrine was built in 1939, dedicated to Emperor Gotoba who was exiled to the island in 1221. The emperor was exceptionally talented at writing waka, a traditional form of poetry with a syllabic outline of 5-7-5-7-7. 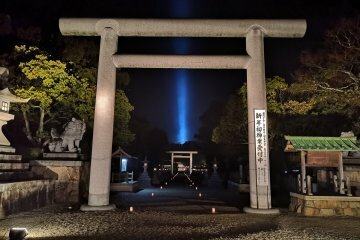 In honor of his skill as a poet, the shrine created a unique ceremony, a night prayer, at Oki Shrine. Here, visitors can take part in a nighttime ritual where they can make their own protective talismans. 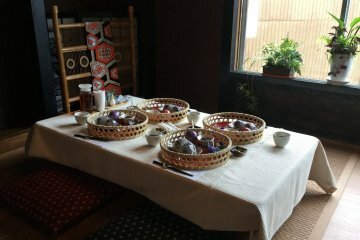 Reservations are required at least three days in advance and to make the most of the experience, it is recommended to come up with your wish (ideally in waka form) before visiting. Looking for a symbol of good luck in love? Look no further than the dynamic Akiya Coast, which, when you walk down a small path adjacent to the crashing ocean waves, shows off a beautiful heart-shaped hole in one of the rocks. The area nearby also boasts a small camping ground and panoramic views of the coast. 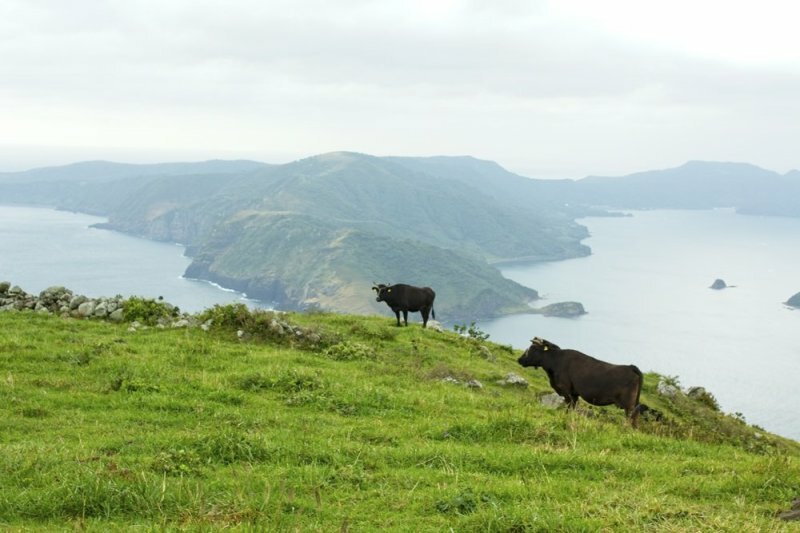 Bonus Highlight: Though the Oki Islands is famous for its beef, it is quite rare and thus hard to find. To get a taste of this delectable specialty, head to Okigyuten for high-quality local fare. From Kansai: Fly from Itami Airport to Oki Airport. The trip takes about 1 hour. From Tokyo: Fly from Haneda to Izumo Airport and then to Oki Airport on Okinoshima. The trip takes a total of about 2 hours. Ferries depart from Sakai-Minato in Tottori Prefecture and Shichirui Port in Shimane multiple times daily. There are also inter-island ferries for travel between the islands. Having just travelled there in November, I must say I'm delighted to read an article on the the Okis. Information is scarce online but visitor information centre on Dogo (and the other islands) were immensely helpful in trip planning. 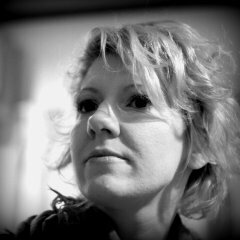 I was in contact with the Dogo Island one and their English was excellent. 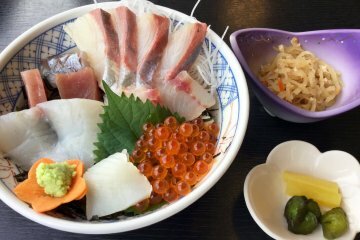 There are many water based activities (and seafood) as well which are probably better enjoyed during the summer months (local rock oysters are generally available March to August, sightseeing boats to see the Candle Island rosoku-jima wrap up by October and kayaking opportunities are scarce in the winter months). Not to dissuade anyone though as their local crab season commences second week of November each year and I hear it is delicious, plus there was so more than I could do in the three days I was there. Oki beef was legendary (best was at Oki gyu as mentioned in the article, near Hishiura Port on Ama island). I'd be eager to visit again in the Summer. Looks like a great place to capture a ton of photos! What a stunning landscape, It looks completely untouched! I wonder what the local cuisine is like, lot's of fish? Definitely a lot of seafood, especially squid and sazae (turban shell). The famous oki beef that they raise here is surprisingly hard to find though, since they send most of it to Tokyo and other big cities. 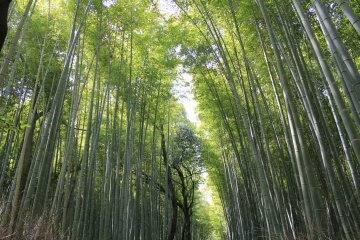 Japan is amazing country with unique nature! Thanks for sharing! It really is! No matter how much you know or see, there's always something new and surprising!